Occupational Therapy and Stroke guides newly qualified occupational therapists (and those new to the field of stroke management) through the complexities of treating people following stroke. It encourages and assists therapists to use their skills in problem solving, building on techniques taught and observed as an undergraduate. 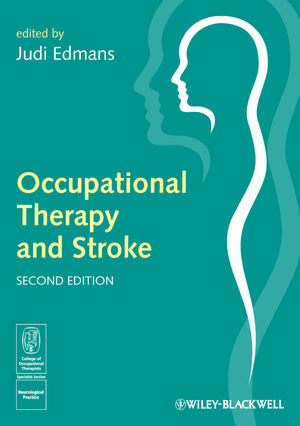 Written and edited by practising occupational therapists, the book acknowledges the variety of techniques that may be used in stroke management and the scope of the occupational therapist's role. Chapters span such key topics as early intervention and the theoretical underpinnings of stroke care, as well as the management of motor, sensory, cognitive and perceptual deficits. They are written in a user-friendly style and presented in a form that enables the therapist to review the subject prior to assessment and treatment planning. Complex problems are grouped together for greater clarity. This second edition has been fully revised and updated in line with the WHO ICF model, National Clinical Guidelines and Occupational Therapy standards. It is produced on behalf of the College of Occupational Therapists Specialist Section - Neurological Practice. Dr Judi Edmans is an Occupational Therapy Researcher in the Division of Rehabilitation and Ageing, School of Community Health Sciences, Queens Medical Centre, Nottingham. She is Editor of 'Neurological Practice'. 1 Introduction (Judi Edmans, Fiona Coupar and Adam Gordon). Medical investigations following stroke and TIA. The prevention of recurrence of stroke (secondary prevention). Damage that can occur in different areas of the brain. Policy documents relating to stroke. 2 Theoretical Basis (Janet Ivey and Melissa Mew). 3 The Occupational Therapy Process (Melissa Mew and Janet Ivey). 4 Early Management (Sue Winnall and Janet Ivey). Other impairments impacting on functional ability. 5 Management of Motor Impairments (Stephanie Wolff, Thèrèse Jackson and Louisa Reid). Positioning the early stroke patient. 6 Management of Visual and Sensory Impairments (Melissa Mew and Sue Winnall). 7 Management of Cognitive Impairments (Thèrèse Jackson and Stephanie Wolff ). 8 Management of Perceptual Impairments (Louisa Reid and Judi Edmans). General assessment and intervention plan. 9 Resettlement (Pip Logan and Fiona Skelly). Support available after a stroke and self-management. Getting out of the house and transport. 10 Evaluation (Fiona Coupar and Judi Edmans). Methods of recording occupational therapy intervention. Pros and cons of multidisciplinary joint documentation. Implementing findings into clinical practice and evaluating outcomes.